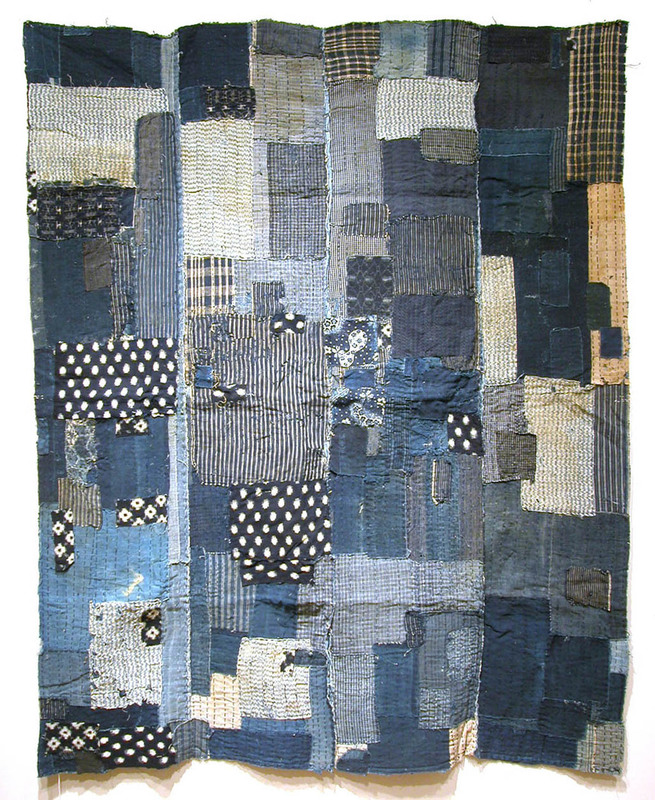 The repeatedly mended indigo-dyed futon covers and garments used and worn by farmers and fishermen in Pre-World War II Japan are far more complex than mere patchwork. These boro (translated as rags) contain in their layers of shima, kasuri, hemp thread and other recycled materials, a vernacular history of survival and creative ingenuity. A fascinating aspect of boros is that they are a form of art history in process. They embody the passage of time. They are arrangements of ideas and memories, mnemonic devices of the soul. The Gees Bend quilts, in contrast, represent a single act of memory. The saved pieces of recycled cloth are pieced out in a single manifestation of creation. A boro records a process that can extend over one hundred years. They are a textile version of a mountain or stone or any natural phenomenon that is prone to change, and that change inspires renewed contemplation and appreciation. Boros were also a reflection of the changes in the outside world as various scraps of cotton manufactured over time became incorporated through the harsh and frugal world of their makers into a futon cover or jacket. The message of survival and hope, emblematic in these utilitarian objects, is visible in their rough beauty. A boro combines the intimacy of the personal choices and marks of its maker with the larger patterns that manifest when it is seen from a distance. The Japanese especially have been known for raising the utilitarian object to modern works of timeless art. It is no accident that the boros seem to rhyme with those works of Western art that sought to examine visually some of the same concepts intrinsic to Japanese aesthetics; emptiness, silhouette, eloquent silence and the deep-seated affectations of minimal forms. This is Cavin-Morris Gallery’s second exhibition of Japanese textiles and the first exhibition in a New York gallery focusing only on the wide variety of boros. In Gallery Two, we will be previewing some of our burgeoning collection of Contemporary Japanese Ceramics, and in addition, have on display Southeast Asian textiles, jewelry and amulets from Chinalai Tribal Antiques.